Ran the K2 at 5w to 100' wire. Ended up with 46 contacts. Worked only 19 SPC's. Only one, ON, in Canada. But the pesky Texans were out in force: TX, 9; NC, NY, PA, 4 each; CO, NH, WI, 3 each; CA, ON, TN, VA, 2 each. Q'S by band: 3/18/25 on 80/40/20. SPC's by band: 3/11/18. Only three banders were K9OM and WB5BKL. 10 two banders. I was surprised at how well WI was coming in on 80 near the end. K9OM was something like 20 over. A fun evening for sure. Thanks to everyone who stopped by and see ya'all next month! 29 contacts, 15 states. Seems as though this was a good night for this activity. Was using an LNR end fed 40/20 strung inverted vee style from a Jackite pole. So I was limited to two bands. Eleven of my 15 contacts on 20 meters was done in the first 30 minutes. The last of my 14 contacts on 40 meters was at 0240Z. Huge kudos go out to K2YGM in NY for being super persistent. I asked him for repeats too numerous to count and we finally completed the exchange. This was my last contact on 40 meters. The big sig for me came from NØTA on 20 meters and from K5JHP and WB5BKL on 40 meters. Always nice to have K4BAI in the log as well as W5ACM and WA5BUC. I used to sit side by side with W5ACM and WA5BUC when I was active with the HQRP group out of Houston. This was my first Spartan Sprint and one of my first CW contests ever. I'm working hard on my copy and sending so thanks to everyone for QRS and repeats. Radio was an HB-1A with eight NiMH AAs and a J-38 on a small block of wood. A 40 meter dipole is the only antenna I have up right now so all my contacts were made there. Hoping to get better every month! Trying out a newly “assembled” rig tonight and while 20 meters sounded a little weak, 40 really started coming alive more and more. What a delight! Thanks for the good contacts with new and familiar calls tonight. While I’ll never win one of these QRP contests, it certainly is a pleasure to be able to stop and talk with old friends in the middle of one of our fun Sprints. Many thanks to Richard and his huge staff for sponsoring the A.R.S. events. 6 contacts on 20m using a MFJ 9020 to a dipole. One contact on 80M on an Omni VI+ running 5 watts, same dipole.No telling what all this weighs. The MFJ not so much. The Omni, a lot! I hoped to use the MFJ exclusively but ran out of stations to contact on 20M after 2100 Central. I didn't hear much on the other bands either. Maybe everybody was on at the start and then pooped out fast. It was good to dust off this little MFJ rig and see what it could do, again. Better luck next time. Only had a brief window of time to operate, but it was fun. All contacts were on 40 meters. First timer - Thanks for the Q's. KD1JV Tri-Bander (borrowed from Dale, WC7S), doublet w/BLT, Palm Mini, Gen Log. OK, I only worked the last four minutes and have never heard of the contest sprint but thats my fault! hihi After I heard K9OM calling CQ SP I had to go look it up! So... 3 contacts, no laughing. Horrible question: Weight? Uhhhh, 25 pounds, I guess. Now that I know this is here the first monday of the month, I will be back! That was way cool. I decided to go out into the park and operate the WVØH 40m Park Portable Doublet with the KX3 and make couple of QSOs. The center was up 30 feet and I tried leaving the ends sag low; about 8 feet for a change. Wow! Was I pleasantly surprised. I started out on 20 and propagation was good. Double hop from CO to PA was wavering quickly and there was fast QSB but patience paid off. Each QSO took a little longer but it was worth the effort. After hanging out on 20 for an hour I switched to 40 meters and the band seemed noisy but workable. Thanks to all the regulars the new calls too. Next time I will remember the bug spray. This event should really be called the Skeeter Hunt. Maybe a name swap.Thanks for another fun Spartan Sprint. A fun contest as it's always interesting to see how well QRP will work... or not work! In my case, I ran a K3 at 5 watts with my base station antennas which consisted of 3 Tribanders, a 1/4-wave 40-meter Vertical, and an 80-meter Inverted Vee. This may be my best sprint ever. 20 and 40 were very active and quiet. New and old calls on both bands. Started on 20 for 7 Q's. Then on to 40 for 8. Thanks to all. Bands were great tonite. 20 was open up to the end. 40 was good except for QRM. pretty good nite over all. C YA next month. This was the first time in a very long time that I've operated the whole 2 hours of the sprint. Had my first 40-mtr QSO at 0143Z, and my last 20-mtr QSO was at 0240Z, so activity on the two bands overlapped quite a bit (although it was very thin on 20 meters after 0140Z). Station: KX3 on 20 meters, K2 on 40 meters, inverted vees on both bands with the apex at about 40 feet. Ten-Tec Jupiter at 5 W to a 2-element mini-beam at 25 ft for 10, 15, and 20 meters and an inverted vee at 40 ft for 40 m. 15 m yielded one QSO with WB5BKL. 20 m was good for 12 more and 40 m added 10. Bands were better than I expected with an A index of 12. Some sigs were quite loud. Thanks for the contacts and thanks to the organizers. Good conditions on 40 and 20M. No sprint signals heard on 15 or 80M. Nice to work F/FK8IP/P on 20M. Best DX on 40M was NK6A. Worked on both 20 and 40M: K5JHP, NK6A, W5HNS, WV0H, WA5BUC, K3RLL, W1PID, W4VHH, NQ2W, W5ACM, AA5B, N0TA, N3QE, WB5BKL, K9OM. Thanks for all QSOs. I operated with the KX3 and a Windom OCF. Good participation and lots of activity. I strayed off the QRP frequency when it slowed down on 20 meters and worked Kyrgyzstan and Nicaragua. NK6A in California was strong. Nice to work K7TQ in Idaho. Thanks for all the Qs. 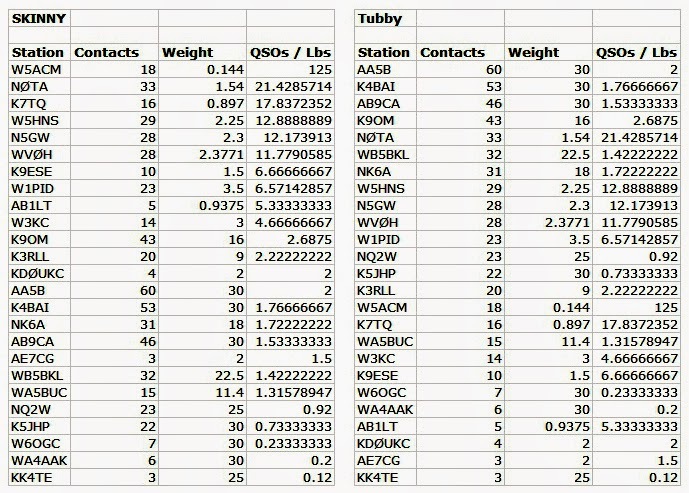 All contacts made on 20M. No one heard on 40M except the ARRL folks parked right on the QRP calling frequency. Still learning the ins-n-outs of my KX1 which seemed a little deaf on 20M. The four 3.2V LiFePo4 batteries I have in it seem to be doing well. They keep the voltage well above 12V so my power is better than 2W with internal batteries. I was up on the TN Cumberland Plateau to escape MS heat for a while, using the KX3 and CFZ. Glad to hear many familiar calls. Q's on 20 and 40, but 80 was QRN. CU all next month. It has been over 8 years since I have participated in a Spartan Sprint. I cruised around the bands and responded to stations calling CQ SP. 20 meters was the money band until around 0200 and then 40 meters was alive with activity. DX was NM and CA from my Northern VA QTH with 5 watts and an Inverted L wire antenna supported by a tree. It was fun. Back again next month. Thanks for the contest. It was great to spend some serious time on 20M this month running the ATS-3A with the backyard vertical. I can’t spend much time calling CQ due to the battery capacity, but I did collect a fine batch of 18 total QSOs on 20M and 40M. W5HNS in San Antonio was a surprise catch. The noise level on both bands was delightfully low this month. I even managed a contact with W1AW/Ø in SD on 7029 kHz. I assume he was NOT running QRP though. He was in contest mode, so I would guess his power at something more than FIVE WATTS, perhaps even a KW . . . I still have some issues with the contacts on my homebrew, ultra-thin-plywood key paddle, but it was a really fun event! here was moderate to heavy QRN on 20M. Thanks to K4BAI, W5HNS, and WB5BKL for this month's Sprint QSOs. the parts together, but it is worth the extra effort. The rig was a KX1 feed with 8 AA alkali batteries, ear pieces, and a Palm Mini paddle for a total of 0.897 lbs. Not the less than 1/2 lb that others achieve, but much better than my usual 30 lbs. 20 m was still open around the end of the sprint, but most folks had long since moved to 40. I was happy with the 16 Qs that the 2 to 2.5 w the station put out. K3/10 @ 5W to various delta loops and wire antennas. Had 2 QSOs on 15M, 3 on 80M with the rest split between 20M and 40M. Had three-banders with NK6A, K9OM and AB9CA. Best signals in cenTX: 15M - NQ2W, 20M - W4VHH, 40M & 80M - K5JHP. NQ2W and I repeated our apparent pipeline between New York and Texas. Join us on 15M next month! Had fun. Six contacts on 20m in 35 minutes of operating. Signal strengths varied wildly here during contacts... 569 one moment, then below the noise the next! Didn't have a chance to weigh my KX3 with balun and battery pack (est. 3 to 4 lbs. ), so I'm entering Tubby Class this time.